The last of the films for this season was shown on the 18th of December in the Parade Tower. A magnificent grand finale. The Kilkenny Film Club has already organized the next season. It starts with The Night of the Hunter. 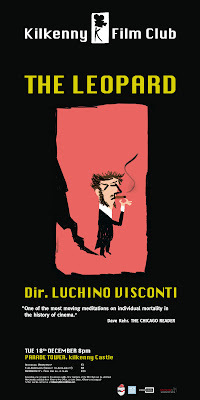 In terms of the illustration, I decided to tell the story of the film using a completely different visual code from that one of the film: humorist cartoon moderne against Visconti's meticulous descriptive style. Posted by Alé Mercado at 7:00 p.m.